In 2018, the Scottsdale Mint launched a new series of silver bullion coins in a partnership with the members of the Eastern Caribbean Central Bank. Serving eight nations in the Caribbean, the ECCB backs the coins of the EC8 Series from the Scottsdale Mint. While the coins were initially introduced one design at a time, November 2018 saw the release of two designs at once in this beautiful collection of gold and silver caribbean coins for sale. The EC8 series started with the Rumrunner design for Antigua & Barbuda, and was followed up by the Saint Kitts & Nevis and Dominica coins in the second and third releases. Rather than introduce the coins separately, the islands of Grenada and Montserrat appear at the same time in the fourth and fifth issues. The coin for Grenada follows the standard set by the previous coins in focusing on the physical island itself, but the coin for Montserrat departs from that tradition with a focus on the nation’s flag rather than its active volcano. The EC8 program includes four options with each design release. There are two coins for investors and two for collectors to choose from when buying silver and gold. The two silver coins have a $2 (XCD) face value backed by the Eastern Caribbean Central Bank, while the gold coins both have a $10 (XCD) face value. The silver coins feature .999 pure silver and the gold coins have .9999 pure gold. The island of Grenada is a country in the West Indies at the very southern end of the Grenadines island chain. The nation consists of Grenada itself and six smaller islands that lie to the north of the island of Grenada. Among its natural wonders, Grenada is home to some of the largest coral reefs in the Caribbean Sea. Its location in Grenada makes the island a must-see destination for snorkelers and divers. On the reverse of 2018 1 oz Grenada Diving Paradise Coins is the image of a scuba diving duo passing the coral reefs off the coat of Grenada and swimming toward a shipwreck on the seafloor. Engravings include only “Grenada” and “2018.” The obverse of the coins features the right-profile portrait of Queen Elizabeth II flanked by fern leaves with engravings of “Eastern Caribbean Central Bank,” “Queen Elizabeth II,” and the coin’s face value, weight, purity, and metal content. The island of Montserrat is unique within the Caribbean. Located in the Leeward Islands as part of the Lesser Antilles chain, Montserrat is a British Overseas Territory and includes a unique nickname as the “Emerald Isle of the Caribbean.” The island bears this moniker similar to that of Ireland for two reasons. First and foremost, Montserrat’s physical appearance from the sea resembles the rolling green coasts of Ireland. Secondly, many of the early outsiders to arrive in Montserrat had Irish heritage. Many people fleeing Ireland arrived in Montserrat as indentured servants, forced laborers, prisoners, or opposition forces. On the reverse side of the 2018 1 oz Montserrat Emerald Isle of the Caribbean Coins is the image of the British Union Jack flag in the upper-left field. In the lower-left field is the coat of arms for Montserrat which includes Erin leaning on a cross and clutching a harp. Erin is the female personification of Ireland and the cross represents Irish Christianity. Engravings include “Montserrat,” “2018” on the coat of arms, and “Emerald Isle of the Caribbean” below. The EC8 Series from Scottsdale Mint will conclude with three more releases. The islands of Anguilla, Saint Lucia, and Saint Vincent & the Grenadines have yet to feature in the series and arrive soon. What is the Eastern Caribbean Central Bank? The Eastern Caribbean Central Bank (ECCB) is the central bank and monetary authority for the Organization of Eastern Caribbean States. The only members of the OECS excluded from this monetary authority are the British Virgin Islands and Martinique. The ECCB issues the Eastern Caribbean Dollar to its seven member states and one associate member. The Eastern Caribbean Dollar, XCD, is the successor to the British West Indies Dollar and has been issued since 1965. Six members of the ECCB are independent states: Antigua & Barbuda, Dominica, Grenada, Saint Kitts and Nevis, Saint Lucia, and Saint Vincent and the Grenadines. Anguilla and Montserrat also use the XCD and are British Overseas Territory. Anguilla is the associate member of the OECS using the dollars issued by the ECB. The Scottsdale Mint is a private minting facility in the city of Scottsdale, Arizona. The mint has made a name for itself in recent years producing bullion coinage for sovereign nations around the globe, from the African continent to the islands of the Caribbean Sea. The mint strikes investment-grade bars, legal tender currency, and collectible gold and silver pieces to attract investors and collectors. 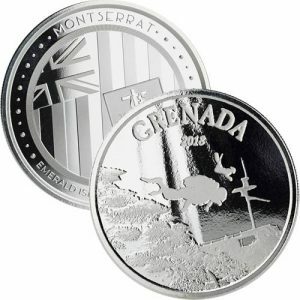 The 2018 Grenada and Montserrat Coins in the EC8 Series are available now from JM Bullion. Whether you’re just starting out in this collection or trying to get your design portfolio up to date, we’ve got the EC8 designs you need. Please feel free to call JM Bullion at 800-276-6508 if you have questions. We’re also available online using our live chat and email address. Don’t forget to follow us on the Facebook and check in weekly with our blog for the latest information on upcoming and newly-released coins.